The first few standard transperitoneal laparoscopic nephrectomies can be very challenging for the novice laparoscopist; operative times and complications are greatest in the first 20 cases (68). Ponsky et al. (69) reported use of one of the hand-assisted laparoscopy devices that can accept a laparoscopic port to simplify the adoption of standard laparoscopic nephrectomy for those already facile in hand-assisted laparoscopy nephrectomy. After insertion of a laparoscopic port within the handassisted laparoscopy device, the laparoscope is placed there and the usual working ports are inserted. At any time during the procedure, the laparoscope can be moved to another port to allow use of the surgeon's hand through the hand-assisted laparoscopy device. In this way, a surgeon can perform standard laparoscopy in those first few cases confident in the ability to rapidly convert to hand-assisted laparoscopy when necessary. 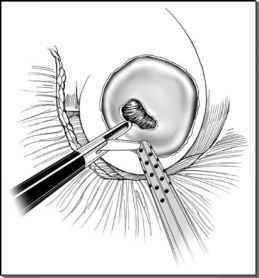 Series have also documented that the "learning curve" of hand-assisted laparoscopy is shorter than the 20 or so cases that is estimated for standard transperi-toneal laparoscopic nephrectomy. Gaston et al. (70), in a prospective survey of senior urology residents trained in open surgical nephrectomy but new to laparoscopy, found that by the fourth procedure residents reported a difficulty level less than that of open surgical nephrectomy. Operating time also decreased with each case, falling to half the duration of the first case by the time of the sixth procedure. Similarly, Wolf et al. (39), in their first 10 hand-assisted laparoscopy donor nephrectomies, found that the mean operative time was reduced from 4.2 hours in the first five patients to 2.9 hours in the second five patients. In a subsequent study, Hollenbeck et al. (71) determined that residents in training performing hand-assisted laparoscopy donor nephrectomy had a statistically and clinically signifi-cant reduction in operating time by the sixth case as primary surgeon. The decline in hand-assisted laparoscopy operative time with experience is more rapid than has been reported in series of standard laparoscopic nephrectomy.